Right – here it is. My first blog post for Dulwich OnView my local online community magazine. I can’t believe how hard it was! I was limited to eight hundred words and it made me realise that I do drone on abit. I find it very hard not to include everything I know. Anyway here it is, all very interesting stuff and great I have found a regional craft right here on my doorstep. I may well feel obliged to revive the local industry from my garden shed, now there’s an idea! I could make mugs. Anyone who lives in Dulwich and likes a bit of gardening will know that six inches below the ground lies thick and heavy London clay. I was doing some digging in my garden the other day, swearing at the nasty stuff and I thought to myself – someone should open a pottery to get rid of some of this. So, whilst breaking my back digging a hole only just deep enough to plant a tulip bulb, I dreamt up a fantastic plan to rid my garden of the gloop. I will start an swap scheme, anyone who wants a bag of my lovely clay to make pots, can come to my garden and dig themselves two sacks full of the stuff and in exchange they can fill the hole back up with couple of sacks of loam rich compost. Now those who know me will realise I always have some new plan or scheme, some good and some really bad, but I honestly think that this one’s a corker. How can it go wrong? As this was obviously such a brilliant scheme, I gave up the digging and went inside to start my cunning plan. Why should I dig when people would soon be queuing up to do it for me? One quick google search later and I discover Lambeth has always been the home of London pottery and interestingly, it is where Royal Doulton all started. I never knew that! To be honest since traditional industries usually developed near the raw materials and since I know Lambeth is built on top of an endless supply of London clay, it shouldn’t have been a surprise that it used to be famous for pottery. Pottery has been produced in Lambeth since the Roman times, at least. The potteries, or pothouses as they were known, were concentrated near the river in the area between Vauxhall Bridge and Lambeth Bridge. Here they could take advantage of the supply of water, easy access to transportation and the low lying location, which provided the most perfectly humid atmosphere for making pots and most importantly was the supply of London clay. Lambeth’s fame for pottery really took off in the sixteenth century when tin-glazing came to England. Tin-glazing, or Delftware, is a method of producing a white glazed pottery, which can be over painted with metal oxides to create intricate patterns or pictures and back then this was cutting edge pottery technology. Lambeth Delftware proved very popular, pothouses produced tiles, wine jars, and apothecary pots. The industry got a real boast in the mid seventeenth century with the introduction of tea and chocolate into English polite society. The ladies who lunched were desperate for the very latest teapots and cups to show off at their tea parties. The most famous of the Lambeth stoneware potteries is now known as Royal Doulton, but it started back in 1815 as Doulton and Watts. If truth be told, Doulton and Watt’s made their mark by making the most boring, unglamorous of stuff – leech holders for doctors, ink bottles and chemists pots and most famously the sewage pipes under the roads of LondonIn the 1850′s, after making themselves some money from all the boring stuff, the company began a new initiative called Doulton & Co’s decorative stoneware. They teamed up with nearby Lambeth School of Art to produce highly decorative tableware, sculptural panels and tiles. It must be said, there were other stoneware potteries in Lambeth and James Stiff and Sons and Stephen Green’s Imperial pottery deserve a mention, but it is fair to say Doulton quickly eclipsed other local firms. Then, in 1901 the company became Royal Doulton courtesy of Edward VII and continued to be a big employer in the area. But pottery production on any great scale stopped abruptly in 1956, when the factories had to close due to the new clean air regulations. But never mind the history lesson – back to today and my cunning plan. You may have noticed that times are hard and banks aren’t lending, yet I really think I may have discovered the solution for many Lambeth residents. It’s been here all along, right under our feet, gardens full of a heritage product! Tons and tons of world famous ‘Lambeth Doulton Clay’! Never mind swap schemes, I’m going to sell my clay! Local clay for local potters. With a bit of clever marketing I am sure it would work. Now I just need a plan to decide what to do with the massive hole I will have in my back garden! In the meantime, before I get around to digging myself some London clay I have . found someone who already uses it to produce lovely little bird sculptures. Find them here at LondonClayBirds.co.uk. How sweet are these!! 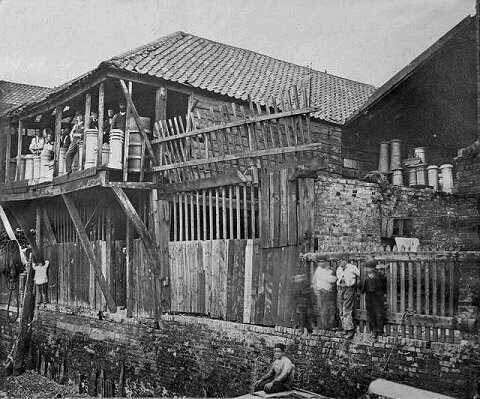 The Lambeth cholera outbreak of 1848-1849 – Amanda J. Thomas, McFarland & Co Inc.
For a very long time traditional crafts have existed without any formal support network outside of each individual crafts guild or association. The Heritage Crafts Association is a new association that has been set up to represent the interests of all traditional crafts which do not fall under the remit of other organisations. The Crafts Council support and promote contemporary crafts, heritage building crafts have the Prince’s Foundation for the Built Environment, but for a long time traditional crafts which don’t fall under either of these umbrella’s have had to muddle along on their own. Clog makers, trug makers, traditional weavers, besom broom makers and a whole host of others have long known that their crafts skills are an important part of living heritage but there has been no organisation to represent them. Until now! I think the formation of an organisation to promote and protect tradition crafts as living skills, rather than activities which belong in museums can, only be a good thing. After all as my journey around the country is proving traditional crafts and the skilled craftspeople who practice them, help to define the individuality of an area and link us to our heritage and locality. If it is true that human progress is made possible by our ability to pass on knowledge and experience then it is imperative these traditional crafts are seen as part of our living heritage rather than packaged as historic reenactments . They form part of our cultural inheritance and as such we are obliged to pass them on to the next generation. So, the Heritage Crafts Association can only be a good thing as far as I am concerned. Prince Charles agrees with me, he has agreed to be the Association’s president, which for an organisation only a couple of years old is no mean feat. They have also gained support amongst government departments and all this in two years – amazing! Some crafts need a bit of a push and the craft of swill making is one of them. So I shall be highlighting some of the crafts I have encountered which are teetering on the edge of extinction, almost consigned to history, but not quite. The craft skills which have been passed from generation to generation for centuries, now being practiced by just a handful of people. I shall start with the Cumbrian Oak Swill. You will recall from a previous post about cumbrian swills, these baskets were once used in many different walks of life; mining, shipping and farming to name but a few and there was a thriving basket making industry to supply the baskets. Today this thriving industry has contracted down to one full time swill maker, Owen Jones. He is the Cumbrian swill maker. It is quite astonishing to think a whole cottage industry has dwindled down to one individual in a generation. I am not sure what Owen Jones thinks of his role as custodial of the swill making craft, it must be a bit weird to know everyone is documenting you as an endangered species. There are even videos of Owen Jones making a swill archived at the Museum of Rural Life at the University of Reading, just in case he decides to jack it all in and retrain as a banker. But I am happy to say that right now Owen Jones retraining as a banker seems unlikely. I have just ordered my first oak swill from Owen and he didn’t mention any plans to stop. In fact he now has an apprentice, so hopefully the craft of swill making is safe for the moment. 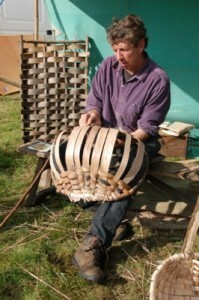 Here you can order an oak swill in a variety of sizes, find out which craft fairs Owen will be demonstrating at and also book yourself on to a Swill Making course. Now that’s something I fancy, three days in the Lake District learning how to make a swill. I have got a plan to make a really big one and use it as a chair – yes, obviously I would need to put some legs on it! 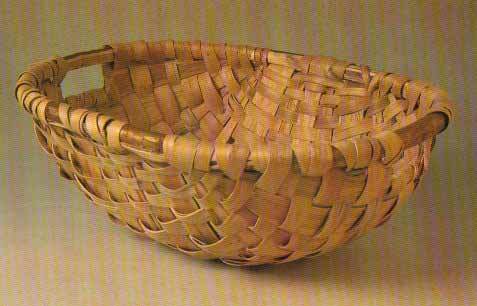 NB – Are you a maker of swill baskets? Let me know so I can add you to my list.